Wearable, textiles-based electronics present new possibilities for flexible circuits, healthcare and environment monitoring, energy conversion, and many others. Now, researchers at the Cambridge Graphene Centre (CGC) at the University of Cambridge, working in collaboration with scientists at Jiangnan University, China, have devised a method for depositing graphene-based inks onto cotton to produce a conductive textile. The work, published in the journal Carbon, demonstrates a wearable motion sensor based on the conductive cotton. Cotton fabric is among the most widespread for use in clothing and textiles, as it is breathable and comfortable to wear, as well as being durable to washing. These properties also make it an excellent choice for textile electronics. A new process, developed by Dr Felice Torrisi at the CGC, and his collaborators, is a low-cost, sustainable and environmentally-friendly method for making conductive cotton textiles by impregnating them with a graphene-based conductive ink. Based on Dr Torrisi’s work on the formulation of printable graphene inks for flexible electronics, the team created inks of chemically modified graphene flakes that are more adhesive to cotton fibres than unmodified graphene. Heat treatment after depositing the ink on the fabric improves the conductivity of the modified graphene. The adhesion of the modified graphene to the cotton fibre is similar to the way cotton holds coloured dyes, and allows the fabric to remain conductive after several washes. Although numerous researchers around the world have developed wearable sensors, most of the current wearable technologies rely on rigid electronic components mounted on flexible materials such as plastic films or textiles. These offer limited compatibility with the skin in many circumstances, are damaged when washed and are uncomfortable to wear because they are not breathable. “Other conductive inks are made from precious metals such as silver, which makes them very expensive to produce and not sustainable, whereas graphene is both cheap, environmentally-friendly, and chemically compatible with cotton,” explains Dr Torrisi. The work done by Dr Torrisi and Prof Wang, together with students Tian Carey and Jiesheng Ren, opens a number of commercial opportunities for graphene-based inks, ranging from personal health technology, high-performance sportswear, military garments, wearable technology/computing and fashion. Graphene is carbon in the form of single-atom-thick membranes, and is highly conductive. The group’s work is based on the dispersion of tiny graphene sheets, each less than one nanometre thick, in a water-based dispersion. 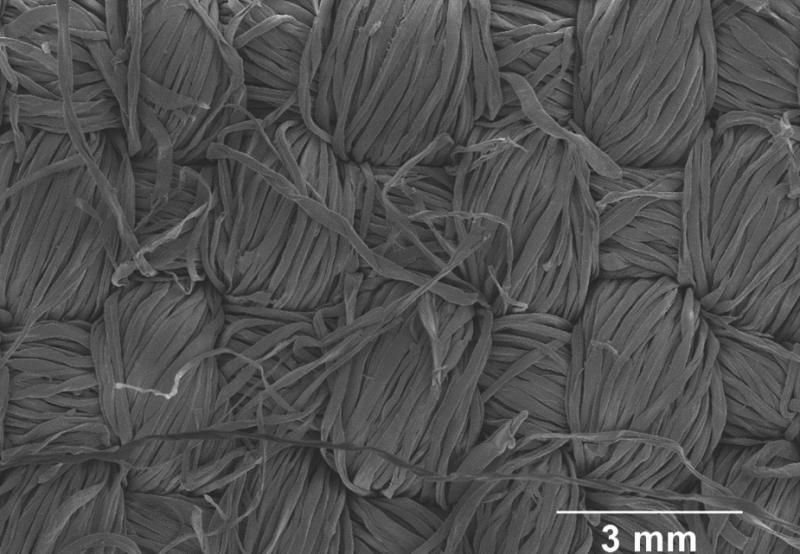 The individual graphene sheets in suspension are chemically modified to adhere well to the cotton fibres during printing and deposition on the fabric, leading to a thin and uniform conducting network of many graphene sheets. This network of nanometre flakes is the secret to the high sensitivity to strain induced by motion. A simple graphene-coated smart cotton textile used as a wearable strain sensor has been shown to reliably detect up to 500 motion cycles, even after more than 10 washing cycles in normal washing machine. The use of graphene and other related 2D materials (GRMs) inks to create electronic components and devices integrated into fabrics and innovative textiles is at the centre of new technical advances in the smart textiles industry. Dr Torrisi and colleagues at the CGC are also involved in the Graphene Flagship, an EC-funded, pan-European project dedicated to bringing graphene and GRM technologies to commercial applications. Graphene and GRMs are changing the science and technology landscape with attractive physical properties for electronics, photonics, sensing, catalysis and energy storage. Graphene’s atomic thickness and excellent electrical and mechanical properties give excellent advantages, allowing deposition of extremely thin, flexible and conductive films on surfaces and – with this new method – also on textiles. This combined with the environmental compatibility of graphene and its strong adhesion to cotton make the graphene-cotton strain sensor ideal for wearable applications. The research was supported by grants from the European Research Council’s Synergy Grant, the International Research Fellowship of the National Natural Science Foundation of China and the Ministry of Science and Technology of China. The technology is being commercialised by Cambridge Enterprise, the University’s commercialisation arm.